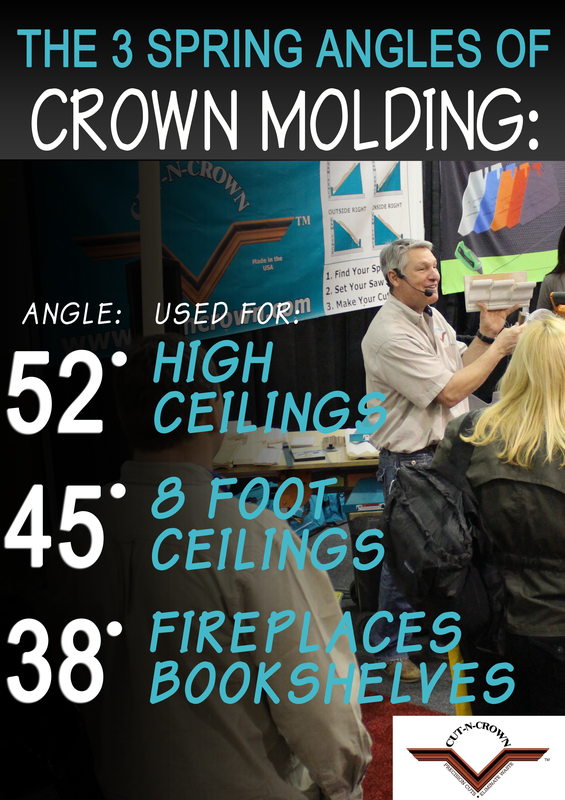 We have been answering any question people have had for crown molding for many years. Few realize it but many become frustrated by it. If you are going to cut and install your own crown molding you have to know it: Spring Angle. If this sounds foreign to you than please look closely at this picture. This picture says it all. 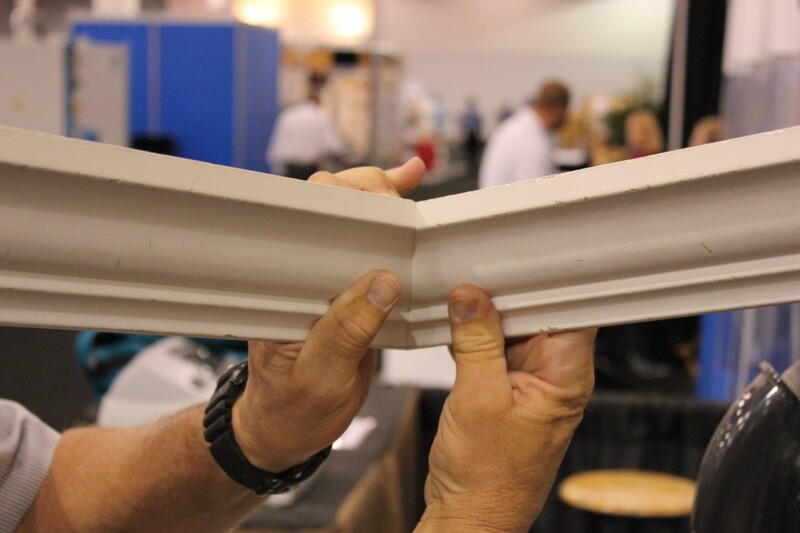 Sometimes unknown, crown molding has three different spring angles specifically for the purpose of showing off the crown molding specific to your application. The 52 degree angle protrudes farthest from its source in order to show the detail of the crown molding when placed in higher situations. The 45 degree angle sits perfect for levels just above the line of sight and the 38 degree angle is made for pieces that will sit at or under the level of your eyes. It is important when installing crown molding you know which spring angle works best for you. Remember when using our jig if you need help with anything you can call us, our phone number is on the top of our website and we are here to help make cutting crown molding as easy as possible.You can also take a look at our youtube site for more informative videos on how to cut crown molding! This is a great way to secure wood against your table saw fence! Have you ever tried to rip material on a table saw and had it continually pull away from the guide? Well, I have a jig just for you. Watch the video below to learn more. We Love ALL woodworkers. Broad Statement, we know, but the industry itself is full of so many great talents we wanted to throw out a big net. The tendancy for our product, cutncrown crown molding cutting jig, is to sway towards the do it your-self guys. Guys who have never touched a poiece of crown molding but are going to give it their best. Well usually after about four sticks of 16 foot molding and a lot of dollars wasted the seek us out. They seek us out because we make it simple, easy and attainable. This gentlemen uses this for his business and also teaches his guys how to cut crown molding with our crown molding jig. He said it makes the task that much more simple for them and allows him not to have to be on site while he is doing it. We still get the naysayers around the web who do not believe they need this jig due to its price or having to lug around a tool but they forget how quickly the entire system pays for it self in material and labor costs. We would like to challenge them to try our crown jig and see for themselves how much it can improve their work flow when installing crown molding. Not to mention how quickly their guys will be able to pick up the skill. As they say in that one commercial, we are professional grade! Do you remember the first time you put together your first woodworking project…. Did each dot right there represent the minutes of trying to remember it? The first project here was a mailbox. It had to be put together only using hand tools. Now some of you are laughing at that because in your time you probably only had the option of hand tools, well lets just say we had options at the time and power tools were available, but none the less, only hand tools could be used. It was woods class and the challenge was on, learn how to do it with your hands before you pull the trigger on the easy stuff, the power tools. So we pulled and pushed the saws, we twisted the hand drill, we hammered the finish nails until we had a non-fancy looking mailbox. It took three days of class time. Not quite the woods production one would need to start up a mailbox factory. The next class our teacher let us use the power tools for the exact same blueprint and sure enough true to the title of this blog: 15 minutes later an improved version popped out of production. If you have the right tool, life is easy. Some will argue that one gets a little more in touch with the wood if using hand tools. We would argue, if you want to get more in touch with your project and the wood, build a dog house and sleep in it, because we want the happy look on our wives faces when the project is done. That is a metaphor for we want the wood project perfect and we want that wood project done! It is not important if we are talking wood crown molding, wood shelving, wood entertainment centers, we just want to finish it. We seek that sense of accomplishment. That is done most efficiently with the right woodworking tools. 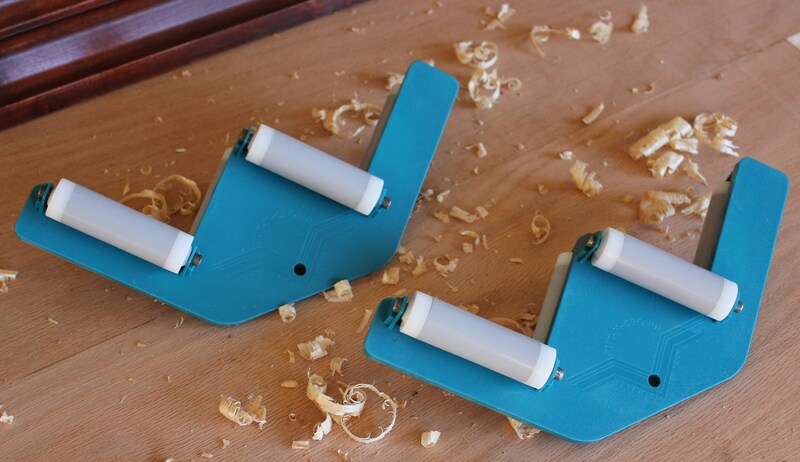 Cutting Crown Molding is much easier with these, our patented roller guides. They hold angled and non angled long stock when matched with your support stand. What we love about this was one of the keys to this tool and something Sheldon mentions quickly in this video. Handling long stocks of wood. Notice we say wood here and not crown molding. Of course it will handle the long crown molding and do it best because of the angles it holds it in but you can set upright baseboard stock in this guides pockets just like a cradle. Once you set it in you can move and adjust that stock for your cut with out having to worry about the wood moving and sliding out of your guide. It was a great feeling the first time we realized this, there was over 900 feet of 5.5″ baseboard to install in the home and the stock was 16′ lengths and it was a little warped and bending all over the place. Trying to get the baseboard to sit on my guide 12′ away became a challenge and there had to be an answer to the problem. That little cradle in the bottom of this guides V shape worked perfect. We liked perfect. We sat hundreds of linear feet in this guide. So if you need help working with long wood stock remember the mantra we all love to live by, The right tool makes all the difference. So Imagine that every thing you did in your life was done the hard way. Picture it with me. Hmmm lets think what is easy in your life but you would prefer to make it hard. How about dialing the phone. When you push a button on your phone it goes beep and dials immediately. How about we go back to the old rotary dial. Press your finger into the slot for the nine and slowly roll the dial around and make sure you go all the way otherwise your phone may think it was an eight and after rolling out ten of those dials and taking about a minute, oh darn dialed the wrong number let’s start over again. That… would be a huge waste of time. Here is another one. Let us remove your dish washer. We have a dishwasher, as do most homes that have seen a renovation in the last 25 years. Funny thing is though I still watch my mom washing dishes when she visits. I laugh because while she spends a half hour prepping, running water, scrubbing, rinsing, drying and putting away those dishes, I spend about two minutes loading and about 1 minute unloading the beloved dishwasher. “It is just the way I like to do it” she will say. Listen if it is comforting to waste time and hence money, then please do keep your creature comforts, but do you mind if we try and move on to learning new things and improving how we do old things. That was a great segway to what is on our minds today here at Cut-N-Crown. As most of you know we are crown molding people. Many years ago we were simple crown molding creating and installing crown molding what was thought of the “simple way”. Though if you remember all of those years ago crown molding was anything but simple. Complicatedly simple, right? “complicatedly” We love making up our own words, or is that a word on its own, not sure, probably does not matter(back to Crown Molding now). Crown molding was hard and it was only after many years and much experience were we extraordinarily good at it. Our clients would say great. It was unexceptable though how much room for error was involved in the process and how hard it was to teach the people who worked for us. So we made the steps to make crown molding simple. Not the complicated version of simple but the truly relentlessly simple. Not sure if the relentlessly description needed to be there, but it is and we like the sound of it. We like relentlessly because we worked very hard to ensure that every step of the way the new how to crown molding was going to be error free and simple. Those keywords turn into time savings and time savings turns into money savings and we do that over and over for you, every time you pull out our jig. Our system was so great that every one now has their own version of it. We promise they are lesser versions, we are the original and the best. The other mock ups of us had to work around our patented design and in doing so created cheap versions that have movements that you do want when striving for perfection. Another thing, if you have a question on that subject please immediately call us and we will tell you why. No Seriously Call, our number is on the first page of our website, we encourage the call and have the knowledge to give you true support. Something else our crown molding jigs did. They did to crown molding what the touch tone did to dialing a phone. Our crown molding tools did to crown molding what the dishwasher did to washing dishes. They saved time by eliminating potential headaches. One of those time savers was eliminating that tedious task of coping your crown molding. It eliminated the need to even bother having to buy another tool or some other invention that makes coping easier. Yea, yet another sub tool in your already over run plethora of tools, a tool to help your tool that helps your tool. Come on, let us just eliminate the need. With the measurement of the Mite-r-Gauge and then the perfect cuts made by our crown molding jigs a coping cut on the inside corner of any crown molding is a waste of time. If the other argument of settling is your reasoning for using the cope cut on crown molding do what we do, an instant glue or even a wood glue. You own that already and the instant glue works in seconds to create a true bond. If you are a purist and find comfort in the cope, then by all means, please continue to cope and do not think we are picking on you. That is not our intention. Our intention is to make your life easy. Enjoy it and have fun, don’t be frustrated and waste it. We want to make the project(and your life) go as smooth as possible.